Also entered in Saturday Busch Series event will be Dale Quarterley. The Busch North regular will be behind the wheel of Randy MacDonald’s #72 car that has been driven this season by Geoffrey Bodine, Kevin Lepage and a few other drivers. Scott Mulkern is one of the most colorful characters in New England racing. The IBG-PASS Pro Stock driver always has time to talk racing, will give his honest thoughts without worrying about what might be politically correct and he wants results every time that he belts into his racecar. It looks like just about anyone with a NASCAR Tour Modified will be coming out this week at New Hampshire International Speedway to make a qualifying attempt for Friday’s race there. That isn’t the only sponsor that is popping up on a Modified at NHIS. Wisk and Snuggle are teaming up with Donny Lia’s #18 team for the event as well. On the heels of the New Hampshire races, will be another big show for Tour-type Modifieds. Seekonk Speedway (MA) will run a $10,000-to-win open show next Wednesday. It is not a points race for any tour or division, but it will be officiated by the True Value Modified Racing Series. Teams from the TVMRS, NASCAR Modified Tour and SK Modifieds are expected for the race. The first two drivers entering the event were Kirk Alexander and Tommy Cravenho. No matter what happens in Ryan Moore’s racing career, the young Maine driver will no doubt look back on July 2005 as a very memorable time in his racing career. Last weekend, Moore finally broke through to victory lane in the NASCAR Busch North Series after two seasons of trying. He won from the pole Saturday night at Lake Erie Speedway (PA) and led every single lap. Moore’s father Kelly, who hold the record for most career Busch North victories, was there to join him in victory lane. This week, both Moores will race in the Busch North event at New Hampshire International Speedway on Friday. Kelly will make his first Busch North start of the season in the #47 while Ryan will wheel the black #74. But that’s not all. Ryan will also attempt to make his NASCAR Busch Series debut for Dale Earnhardt, Inc. in Saturday’s race. He will drive the #81 car with Tony Eury, Sr. as his crew chief. NASCAR Whelen Southern Modified drivers Brian Loftin and Alex Hoag have filed entries for the event. Jamie Tomaino has filed an entry for a second car, as have the Brady Bunch team. Neither of those entries have announced drivers yet. 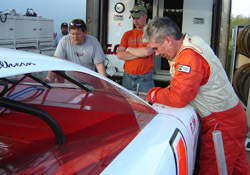 Scott Mulkern talks with his crew earlier this season at Riverside. There will be no shortage of Modifieds at NHIS this week. Usually, those are all good things that are sorely missing in most of modern day racing. Sometimes though, it can create a little bit of trouble. That’s exactly what happened to Mulkern at the Oxford PASS event two weeks ago. With two laps to go, he was racing hard with Mike Rowe for the lead when the two bumped. Mulkern got sideways and Ben Rowe also made contact with him. This led to Mulkern sailing off the banking and out of contention for the lead. So when the Rowes came around on the next lap, care to guess what happened? Let’s just say this, Johnny Clark was the surprised winner of the race when all was said and done. After that, things got even more ugly. A confrontation between Mulkern and Rowe’s team ensued and the police got involved. Mulkern skipped last week’s PASS race at Unity after running the full season before that point. Rumors have been flying all over the internet by many who have been armed with few facts, but plenty of opinions. This week, Mulkern issued a statement on his website apologizing for what took place and pointing out the fact that while many observers might have opinions, there are really only two drivers that know what their intentions were on the racetrack. Mulkern also promises to let fans know what his future racing plans are soon. Please click here for the full statement. There were be plenty of racing in New Hampshire this weekend and Speed51.com will be all over it. Our Northern team of Mike Twist and Justin St. Louis will be joined by Bob and Matt Dillner for coverage of the Busch North and Modified Tour events on Friday at NHIS, as well as the IBG-PASS race Saturday night at White Mountain Motorsports Park. We’ll have all the stories from both tracks right here next week.